UH Bauer students had an impressive showing at this year’s CME Group Commodity Trading Challenge, claiming five of the top 10 spots. Bauer student Cameron McHugh (above) shouted his way to the top. 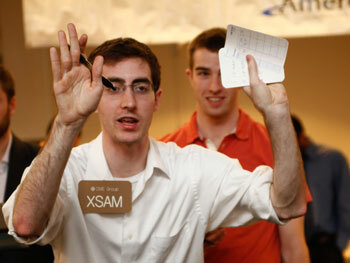 claiming second place, during the 13th Annual CME Group Commodity Trading Competition on March 23. Twenty students from the C. T. Bauer College of Business at the University of Houston shouted, gestured and made a scene this weekend during the 13thAnnual CME Group Commodity Trading Competition held in Melcher Hall. They competed against participants from 11 other schools across the globe, with Bauer students claiming half of the spots in the overall top 10, including second place and fourth place finishes. 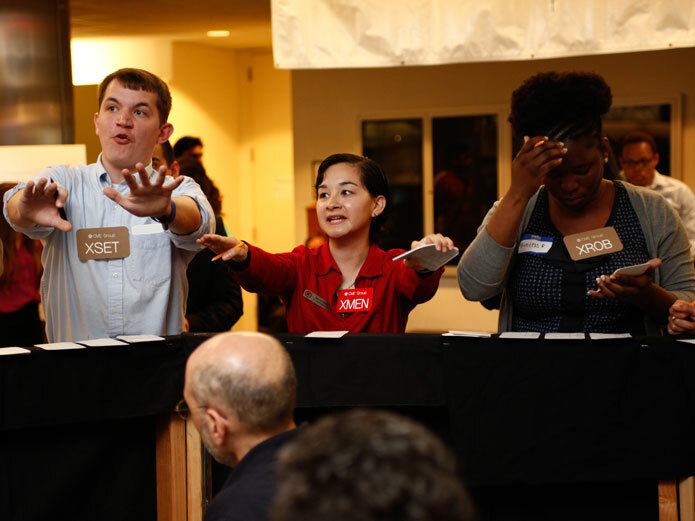 Organized by the Finance Association student organization at Bauer and hosted March 23 on campus, the open outcry competition required students to test their ability to buy and sell oil contracts using the traditional trading terminology and fast-paced hand signals. Bauer students claimed five places in the top 10, with Cameron McHugh taking the second prize of $500, Yejie (Jenny) Jiang taking fourth place, and Siddarth Kapoor, Jaime Esteban and Cesar de la Cerda rounding out the top 10. “That helped me execute my market and limit orders for my clients, as well as trade on behalf of my own account when arbitrage opportunities existed,” he added. Bauer has hosted the competition for a number of years, with the weeks leading up to the big day serving as opportunity for coaching participants, who learn about the how markets move due to the supply and demand of a simulated economy, trading crude oil and gas futures. To determine the winners, judges assess the students’ use of outcry techniques while listening and reacting to the changes in market. Before the competition began, the students had the opportunity to participate in a panel discussion featuring Megan Shlain, energy trader at Sequent Energy Management, Elliot Sorkin, broker at Amerex Brokers LLC, Matt Fleming, director of Midwest and Canadian Optimization for BG Group, and Deniese Palmer Huggins, program director for EUCI.